Yesterday I wrote about the Pope’s visit to Palestine and the strange moments Mahmoud Abbas shared with the Pontiff. Monday evening, it was Benjamin Netanyahu’s turn in trying to show some love towards the Christians of Israel. Maybe his mistake of claiming that Jesus spoke Hebrew is a bit less scary than Abass’ antics, but it is exemplary for the tough relationship between Israel and the Church, and between Jews and Christians. The Pope corrected Netanyahu and said that Jesus spoke Aramaic, which Netanyahu quickly confirmed and added “but he did know Hebrew”. As a native Aramaic speaker (more specifically Syriac, the Western Aramaic dialect of Edessa) I was thrilled to see Netanyahu getting his facts served right, but at the same time I realized that we as Christians have a very long way to go in safeguarding our culture and heritage when even the PM of Israel struggles with our history, although Arameans have always lived in Israel. Recent changes in applying for military service made it possible for ‘Christian Arabs’ to join the ranks voluntarily. Some christian groups, mainly based in the West Bank, see this as a deliberate attempt by the government to split Christians. Others, like some Aramaic Christians I know personally, welcome this step and even petitioned the governemt a year ago to allow them to enlist. ‘It’s our country too and we need to make clear to everyone that we are not Arabs. This will help us’. It’s a small step in the emancipation of this small group but it’s an important one. Abraham said; ‘my father was a wandering Aramean’ and in the years after, the Syrian Orthodox especially, have always wandered and lived under various rulers. After the fall of city states such as Damascus the people learned how to survive and pass on their culture and identity to this very day. When I introduced myself as ‘Aramit’ to IDF staff at the airports and various checkpoints, their eyes widened and I was treated with admiration even. The Pope maybe has opened the eyes of Israelis a little bit, but there are still a lot of fires raging threatening the presence of Christians and their culture and traditions. Much more work is needed, but with this Pope, I think we have an excellent advocate. How inappropriate these pictures may be, Abbas feels he’s free to use them and express his opinions to the world. I would not deny him this right, but only if he also would consider the same freedom and rights for his Christian countrymen. 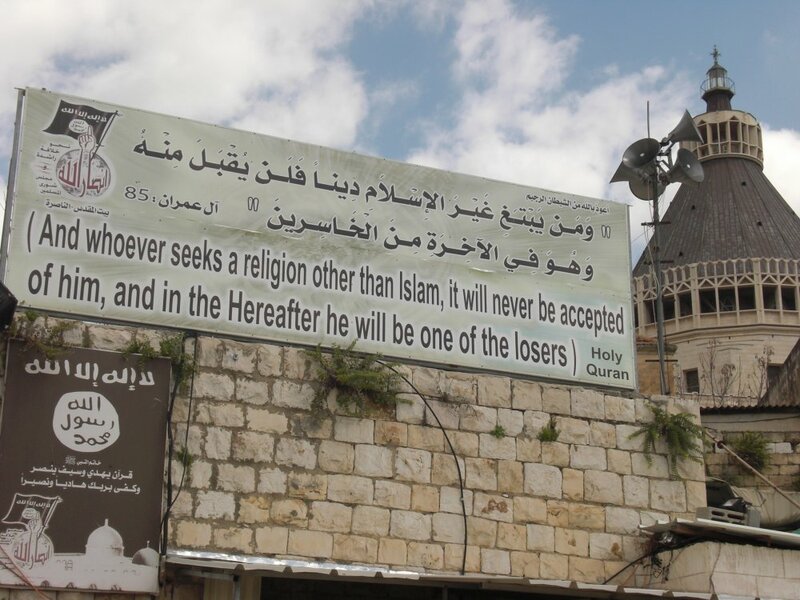 Two weeks ago I wrote about islamist groups profiling themselves in Bethlehem and Nazareth. By distorting the narrative of the Bible and the image of Christ, Abbas is aiding those who do not allow a Christian presence in the streets, towns and villages where not only Christianity began, but where millions of people travel to experience what it is like to truly walk in His footsteps. Pope Francis has invited Abbas to visit the Vatican, I would also recommend to give him a crash course on Christianity. 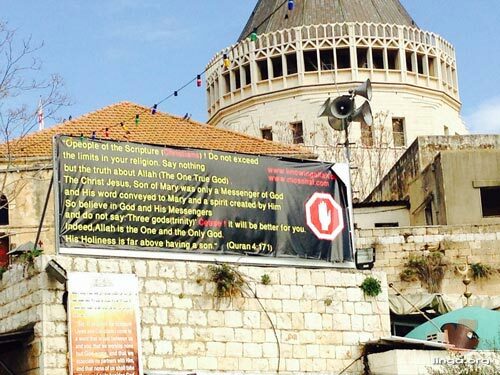 A strange thing occurred in Bethlehem last Saturday: at the entrance to the Nativity Church a group calling itself ‘Dar assalam for introducing Islam’ was handing out free copies of the Quran and other books on Islam. There are two things that are unnerving: first, there is a mosque on the other side of Manger Square, and second, why does Islam need introduction in this particular part of the world? Tensions almost never cease to be high in Israel or the Palestinian Territories, however the remaining Christians could live in relative peace the past years. To the law, they are as mobile and free as their Palestinian countrymen. However, I cannot see this handing out of books in front of one of the most important and oldest churches in the world as nothing short of a provocation. I received comments from Bethlehem that ‘no Christian dares to hand out the Bible in front of a mosque’, and no official institution has commented on the matter since. It is not clear what the true purpose of this organization is, nor what it’s affiliations are. The pictures and texts on their FaceBook page (see link below) don’t seem provocative on first sight, but bear in mind the fragile position of Christians in the Middle East. Some fundamentalist are more subtle than others, but not less dangerous. Of the 26.000 inhabitants of Bethlehem, some 4.000 are Christian. They are not only the caretakers of various important religious sites, but also the indigenous inhabitants of these lands. Christianity was born here, well before the Arabian conquest of the area. Ever since the first ‘introductions’ of Islam the Christians learned to cope with the constant fear for their safety and freedoms. Whether good or bad will come out of this book sharing organization remains to be seen. However, the West should always consider the religious freedoms of Christians when dealing with Israel and the Palestinian Authority, especially when the local authorities turn a blind eye.